The much anticipated solo debut from California singer/songwriter/guitarist Mick Rhodes, featuring 13 tracks of Americana tinged rock 'n' roll. It stomps and swaggers, then tears your heart out the next minute. Delicate, raucous, thoughtful and intense. 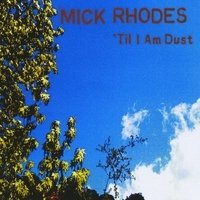 "'Til I am Dust," is the much anticipated solo debut from California singer/songwriter/guitarist Mick Rhodes, featuring 13 tracks of Americana tinged rock 'n' roll. Rhodes' long resume includes Los Angeles punk rockers Human Therapy, The Flamethrowers, Kent State, the Holy Rollers, and more than a dozen other bands. Inspired in the late '90s by nights spent at LA's legendary Cinema Bar, watching the great Randy Weeks and Mike Stinson, Rhodes began writing in a new vein. The new songs leaned more toward the rough southern soul of Lucinda Williams than the loud/fast sound of punk. A few years later the songs were honed and expanded on, with some of the tunes you hear on this record culled from that early burst of creativity. Once the band was assembled - featuring Brian Hall on guitar, Wyman Reese on keys, Doug Baker on bass, and Brian Wells on drums - the recording of 'Til I am Dust began in the fall of 2009. Several new songs were added as the recording took shape, with Wyman Reese and engineer Jon Crawford guiding Rhodes and the band throughout.